Conventional education in the West is so devoid of finance that its progeny, aside from the few with astute parents, are illiterate on such matters. Mountains of student debt, around half of which will never be paid back, stand as testament to this shortcoming. While I dodged that bullet by way of an athletic scholarship, my financial education was similarly pitiful. My degree in and curiosity for economics may have given me the right instincts, but I lacked role models and didn’t know how to handle my earnings when I entered working life. Many of my friends and their relationships have fallen victim to financial crises, and I too at times have struggled with unstable employment a long way from home. However, even if I sensed the need to be better informed, I didn’t know where to start. In 2010, while working as a reporter and editor in Louisiana, I was fortunate to come across an event that pointed me in the right direction: the New Orleans Investment Conference. There I met so many inspiring investors and financial gurus, I was motivated to rise in the field. The “one lesson” line is extremely ambitious, and perhaps more of a marketing tactic than anything else. The lesson, that “Wall Street is not Main Street,” amounts to little on its own. 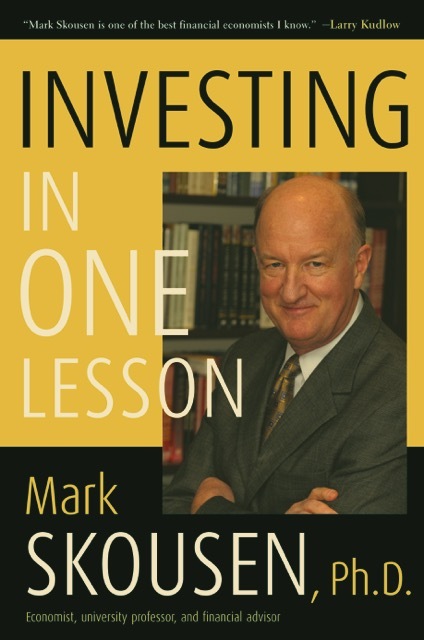 In 175 pages, though, Skousen does make that line meaningful and offer an easy-to-read overview of how to go about investing as a beginner. His basic point is that many of our intuitions on investing are flat out wrong, and that is precisely why so many people do themselves more harm than good by playing the Wall Street casino. I won’t steal his thunder and dish out his recommendations, but he does take an openly contrarian approach and challenge what he sees as the passions or exuberance of stock-market participants. Investing in One Lesson also gets high marks from me for its honesty. Skousen does not resort to get-rich-quick promises, and he cautions people that investing is simply not how most people get wealthy. In the vast majority of cases, he explains, people become wealthy via their own private businesses and professional success. Even worse, often it is the investment professionals who are the ones striking it rich, as they lead their clients astray to garner more commission fees. While the book is a bit narrow in focus, that seems appropriate for the target novice audience without the time for an in-depth work. Further, Skousen references investment classics throughout, so there is no shortage of recommended reading, both for technical insights and inspiration. That is the real value of the book: a gateway to financial education, which should be a long-term priority if you want anything more than very conservative or limited results.